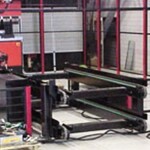 Equipment for separating, handling and transportation of sheet metal. Sheet Metal Handling There are 4 products. 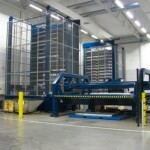 Customized systems for storing and handling material to/between/from different machines. 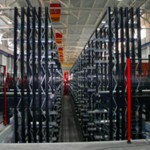 The Auto-store is a device for storing and feeding sheet to machines. It saves space by storing vertically. Lager system for storing and handling pallets. Raw material storage, buffer storage or storage for finished products. Conveyors in multiple levels for raw material and/or machined parts. The Auto-store is a device for storing and feeding sheet to machines. The Auto-store automatically delivers one sheet at a time to one or more machines. Manually operated or operated by interface from served machine. It saves space by storing vertically.